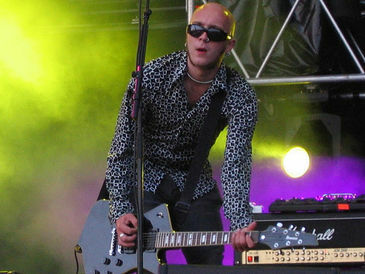 Chris May, commonly known as Chris Catalyst aka Robochrist was recruited as The Sisters' second guitarist for the 2005 Tour and has since been a steady member of the band. Besides his activities within The Sisters of Mercy, he started a first solo project in 2016 (more information down below). Before that, Chris Catalyst had been kicking about Leeds' music scene for several years. Given the incestuous nature of said scene, it can hardly be surprising that someone who had worked at Joseph's Well, the notorious scene of the 1997 Near Meth Experience gig, has joined The Sisters of Mercy. Chris had also worked with then Sisters-guitarist Adam Pearson at Adam's studio in Headingley, Leeds, before. Together they played a one-off gig by The Elvis Presleys From Hell in 2005. A video of this is available on YouTube. A full list of Chris' musical activities can be found here. In 2016, Chris Catalyst initiated a Fundraiser Gig for former long-time nurse to The Sisters' Doktor Avalanche Si Denbigh at Leeds' Brudenell Social Club on November 27th, 2016. He opened the show with an acoustic set. Further performers were The Membranes as well as the Utah Saints, who did the accompanying DJ set that evening. As special guests Near Meth Experience were seen on one of their rare and special days off. For more information see FB Events and The Heartland Forums here and here. PledgeMusic campaign for this solo album started on Thursday 12th, 2016.
was published in October 2016, and a second one, Same Old Sun, followed two months later. The latter can be watched on video here. and a blog, which includes, inter alia, some extended review of The Sisters' 2016 November Tour. it is commcercially available from all the common sources like Amazon or iTunes . The Eureka Machines are, however, by far not the end of Chris' musical activities, the entirety of which is perfectly listed at Wikipedia.... We recommend you also check his discography@discogs. In 2014 the Eureka Machines started a further Pledge Music Campaign for their fourth album, tentatively entitled ‘BRAIN WAVES’, that also included a double DVD featuring 6+ hours of live and promo footage from the former six years. All of the band's albums are available from their online merchandise store, where you can find shirts and stuff as well. To celebrate the end of their Pledge campaign of 2014, and to look into the future, the Eureka Machines did a "frankly embarrassingly huge interview with the nice people at Team Rock, in particular with Matt Stocks, see Do or DIY - The Story of Eureka Machines... Due to the fact that the Pledge Campaign has long finished, the album is now available here or here. Another pledge campaign for their fifth studio album VICTORIES and the 2CD-album RARITIES, a "double-disc compendium of rare stuff" was started in January 2018. The according Pledge Music campaign reached its goal within hours after the start and both albums were released at the beginning of March 2018. Enjoy here on the right side their video for the track Misery from the album Victories. In addition, some tour dates followed in September 2018. The Eureka Machines are currently touring Scotland and England again and have produced an according tour video of their song 'Revolution (see here on the right side). For detailled and up-to-date information on dates and venues, please check out the Eureka Machines' Official Gigs Site or their page on facebook. Chris Catalyst and the Eureka Machines can also be found on Twitter @Chris Catalyst.